Click on the leaflet to read the detail of the message. 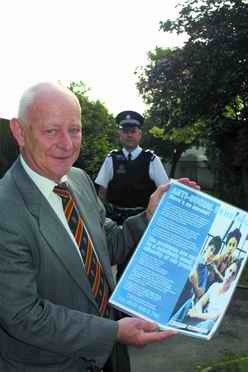 The Garioch & North Marr Community Safety Group has funded an anti-social behaviour leaflet for Westhill in collaboration with Grampian Police. Grampian Police have launched a new initiative designed to tackle anti-social behaviour by a minority of young people in Westhill. The initiative will see every household in Westhill receiving a leaflet, bearing the slogan 'Anti-social behaviour - there's no excuse'. The leaflet's purpose is to remind parents of the crucial part they have to play by instilling a community spirit in their children. As well as the leaflet, other more traditional methods of enforcement such as both covert and overt high-visibility foot patrols by Police will also be employed in the affected areas. The initiative follows in the wake of over 150 calls to Police reporting incidents of anti-social behaviour among young people in Westhill during the first six months of 2004. This period has also seen a 100% increase in the numbers of reported vandalisms from 34 to 68 when compared to those reported in the same period last year, however, a significant percentage of this increase can be attributed to a new, more inclusive system of crime recording that came into effect in April 2004. 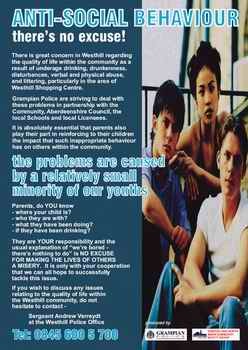 "Although Westhill is a safe community in which to live, in common with many other suburban areas, it has been affected by groups of young people indulging in acts of anti-social behaviour, resulting in numerous complaints to the Police. Anything we can do to reduce the level of this unacceptable behaviour can only benefit our community and so we are delighted to assist Grampian Police in their efforts by sponsoring this initiative." "Incidents involving acts of anti-social behaviour by a small minority of young people in Westhill have continued to affect the quality of life of many residents. Everyone has the right to live without fear of being intimidated by groups of young people or having their property damaged or stolen from their gardens. Underage drinking, vandalism and littering are all common problems here and whilst Grampian Police have a central role to play in addressing these issues, it is essential that parents also play their part by reinforcing to their children the impact that such inappropriate behaviour has on others within the community." "I must stress, however, that the aim of the leaflet is not to preach to parents how to bring up their children. After all, parenting can be difficult enough at the best of times. What we are simply trying to do is encourage everyone to stop and reflect for a moment how they would feel if someone else damaged or stole their property. Ultimately, we are all stakeholders here and we all have a vested interest in maximising the quality of life in our community." ANTI-SOCIAL BEHAVIOUR - there's no excuse! There is great concern in Westhill regarding the quality of life within the community as a result of underage drinking, drunkenness, disturbances, verbal and physical abuse, and littering, particularly in the area of Westhill Shopping Centre. Grampian Police are striving to deal with these problems in partnership with the Community, Aberdeenshire Council, the local Schools and local Licensees. It is absolutely essential that parents also play their part in reinforcing to their children the impact that such inappropriate behaviour has on others within the community. the problems are caused by a relatively small minority of our youths. what they have been doing? if they have been drinking? They are YOUR responsibility and the usual explanation of “we’re bored - there’s nothing to do” is NO EXCUSE FOR MAKING THE LIVES OF OTHERS A MISERY. It is only with your cooperation that we can all hope to successfully tackle this issue.